The Rev. Kali Fyre graduated from Meadville Lombard Theological School in Chicago, where she was a Roy B. Wintersteen scholar. Before beginning the path to ministry, Kali was the office manager for a prominent naturopath and Lyme disease specialist in New Hampshire. Kali has also been employed in retail management at a variety of levels. 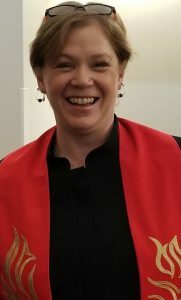 Kali is a member of UUANH (UU Action Network-NH), UU Ministry for Earth, the Network for Spiritual Progressives, and has served the UUA’s Northern New England District. Kali’s social justice work includes rallies with the Poor People’s Campaign; promoting transgender equality in NH with Freedom NH; anti-racism, economic, and LGBTQ justice with Rights and Democracy-NH; environmental and agricultural justice with NH Permaculture Guild and the Women’s Permaculture Guild. Kali discovered Unitarian Universalism through the CUUPs group at her home congregation, which prompted her to co-found the Meadville Pagans and Allies student group while in seminary. Kali is a former state coordinator/president of the Southern NH chapter of Pagan Pride Project, Inc.
Kali is mom to three adult children, and lives with her partner, Jack, on their vintage farm in Weare NH, which they maintain and manage using permaculture and natural farming techniques, as well as humane animal agriculture practices. Kali enjoys knitting and reading, as well as developing her untrained musical skills by singing with TransPosition Musical Ensemble (NH Trans* and Allies Chorus) and learning to play her guitar.